The old Scottish game of curling has been played on the natural ponds and miners’ dams of the Maniototo ever since the Scottish and Irish immigrants arrived to live and work on the land in the mid 1800s. 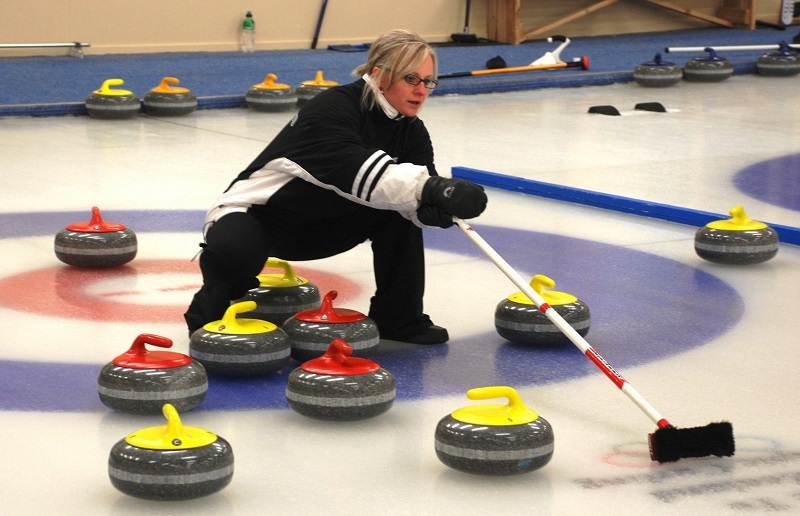 This long history of curling makes it one of the oldest sporting activities in New Zealand. There is only one place in the world today where the traditional ‘crampit’ style of curling is played on the outdoor ice and the Olympic ‘hack’ style of curling played on an indoor rink. This is at Naseby, just down the road from The Old Doctor’s Residence. The Maniototo Curling International rink at Naseby was opened in July 2005 and is the only Olympic size curling rink in the southern hemisphere. It’s the home of the New Zealand Olympic Curling Team. The rink is open all year round, so you must have a go. It’s great fun! To make sure you don’t miss out on a game let us book a time for you. It’s a great experience and something not to be missed when you visit Naseby. Find out more about Curling. Whether you ride the trail from Clyde to Middlemarch or vice versa, it’s hard to believe that this trail was created by men wielding picks, shovels and hammers to the accompaniment of intermittent dynamite explosions. Masons, carpenters and blacksmiths were also employed to construct the bridges, viaducts and tunnels. Riding or walking the trail now is a great opportunity to experience the history and remoteness of Central Otago as well as the superb scenery that cannot be seen when travelling by road through the area. Whether you decide to ride or walk the trail, the Central Otago landscape is stunning in a way that can only be described as breathtaking. From Clyde the trail follows the mighty Clutha River to Alexandra and runs through farmland, vineyards and orchards. The Dunstan Mountain Range overlooks the Manuherikia Valley to the west and the upper slopes are covered in superb golden tussock grasslands. The trail through the Poolburn Gorge is probably the most spectacular section as it passes over the Poolburn Viaduct and through two tunnels cut into the schist bluffs. It then opens onto the Ida Valley and to the north appears the flat-crested iconic Hawkdun Range with its scree and tussock grasslands, usually sprinkled or covered in the winter months with a coating of fresh snow. As you continue on the trail you enter the Maniototo Basin where the big sky, ever-changing cloud formations and distant high mountains dominate the scene. This is the ‘real’ Central Otago and the home of Naseby, the ‘Jewel of the Maniototo’. The imposing rocks and tors of the Rock and Pillar Range to the west, again covered with tussock grasslands, further add to the uniqueness of the trail. We highly recommend that you start or complete the trail with a train ride from Middlemarch to Dunedin through the stunning Taieri Gorge. It’s one of the world’s great train trips. Give yourself plenty of time to see and experience all that Central Otago has to offer. Fascinating visits to historic goldmines, pubs and towns. Exciting action on varied 4-wheel drive and mountain bike tracks. Relaxing times fishing the rivers and dams or playing golf. And of course the challenge of playing curling at the indoor curling rink in Naseby which is open all year around. Or you can just spend time chilling out in the comfort of The Old Doctor’s Residence. 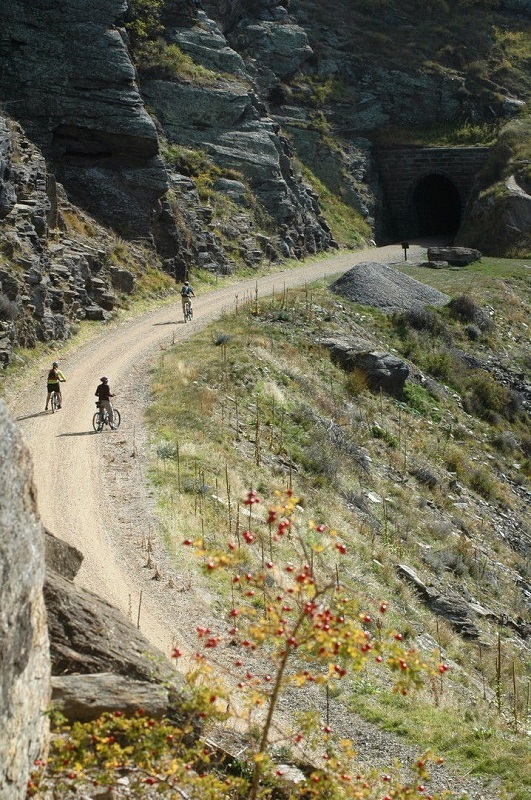 Find out more about the Otago Central Rail Trail. During your stay you must take a stroll around Naseby, the highest town in New Zealand and one of the few to have preserved its history. It really is a “jewel” – a special little place. Visit the towns museums, monuments and historic hotels and homes on foot or bike. Follow the heritage trail around Naseby – you can pick up a map from the Information Centre (a five minute walk from The Old Doctor’s Residence). The Information Centre also holds a wealth of material about Naseby’s colourful past. Click photo above to find out more about Naseby. The broad tussock-covered spaces and big sky of the Maniototo are surrounded on all sides by rugged mountain ranges which lend themselves to being explored by 4-wheel drive vehicles and mountain bikes. There are gravel roads and mountain tracks galore! 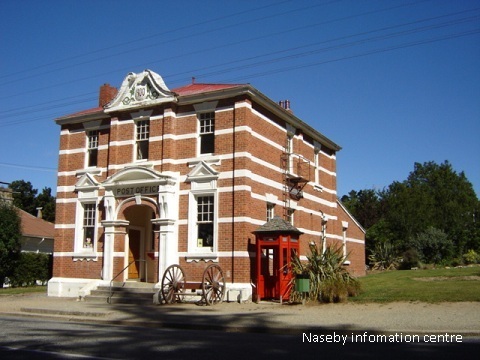 You can visit the historic goldfields at Naseby, Mt. Buster, Oturehua and St. Bathans and experience the many old goldfield pubs of the 1860s that have fascinating histories and stories to tell. From the 4-wheel drive tracks on the Hawkdun Range, there are magnificent sights of the vast high country and views of the Maniototo Plain, the Ida Valley and the upper reaches of the Manuherikia River valley and beyond. You can also see and visit the sheep “runs” that were first opened up in the 1850s. They, along with the gold found in Central Otago, were the basis of New Zealand’s early wealth. Another 4-wheel drive track from Poolburn takes you past the Moa Creek Hotel to the Poolburn Reservoir, the location for the Village of Rohan in Peter Jackson’s Oscar winning film,“Lord of the Rings”. Again, the tussock grasslands and tors make spectacular viewing. A steady ascent takes you up the Rough Ridge and then along to the famous old Serpentine Church, which is a symbol of Otago’s Goldfields Heritage. There are few memorials quite like this lonely stone building - testimony to the hardiness and enterprise of the early goldminers. Again there are stunning views of the vast tussock uplands and the unique Ida Valley. 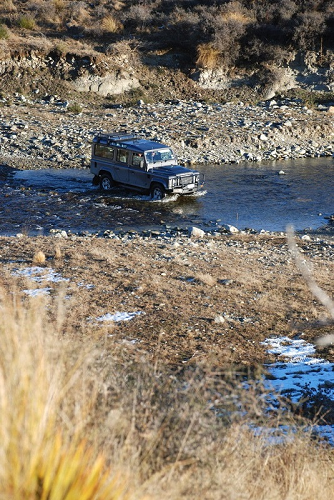 If you have a 4-wheel drive vehicle, come and explore one of New Zealand’s undiscovered treasures, the Maniototo in Central Otago. Alternatively, we can organise your adventure through local guides who offer a variety of excursions. If you want to have this exciting 4-wheel drive experience, let us know as soon as possible so that we can book you a place. They are always busy. Click photo above for more about Maniototo 4WD. Apart from the obvious choice of the Otago Central Rail Trail for your next mountain biking experience, the Naseby Forest Recreation Area has for years been a mecca for mountain bikers from all over the country. If you want the freedom of getting off the beaten track, the district around Naseby has some of the best and varied mountain bike trails anywhere in New Zealand. There are bike trails and tracks through remote areas of wild flowers and tussock grasslands. There are awesome downhill tracks, challenging single tracks and fantastic high country trails. A classic ride which can take up to 6 hours is the Poolburn Loop which also doubles as a great walking track. The ride along Rough Ridge takes you to the historic Serpentine Church, a symbol of Otago’s goldfields heritage. There are superb views of the Ida Valley, and the Manorburn and Poolburn dams. On your descent to the plains of the Ida Valley you’ll join up with the Old Dunstan Road which was the original mountain route for the coaches coming into Central Otago from Dunedin. You then pass the Poolburn dam which was a significant location for the filming of “Lord of the Rings”. Come and explore one of the country’s best mountain bike locations. Organise it yourself or alternatively we can organise your adventure through local guides whose backyard is the remote Central Otago high country. Please click photo above for more information about mountain biking in Naseby. There are many sites to visit throughout Central Otago. Because of its dry climate, the mud and stone buildings, mining equipment and machinery, deep mine shafts and tunnels, impressive sluiced cliffs and discarded tailings all remain for us to see. Dams and water races created as a water source for goldmining are still used today for modern irrigation systems. Apart from the historic sluice-scarred hills around Naseby there are two outstanding sites to visit nearby. Just out of Oturehua, originally known as Rough Ridge, is the Golden Progress mine. Here you can see the only poppet head still standing in Central Otago. The 14 metre structure enabled gold-bearing ore to be brought to the surface from a shaft which was over 60 metres deep. The steam boilers which powered the plant lie alongside. The second site is at St Bathans. The gold rush began at St Bathans in 1863 when gold was found in gullies on Kildare Hill opposite the present hamlet. What was a deserted tussock-covered area in 1862 had become a bustling township two years later with a population of 2,000 supported by 10 hotels and 40 businesses. Mining continued until 1934 when the Maniototo County Council expressed a concern that any further mining would endanger the main street as well as a number of buildings. During this 70 year period, mining reduced the 400ft Kildare Hill to a 200ft pit which, when it was flooded, became the spectacular Blue Lake. The Otago Goldfields Heritage Trail offers you a chance to travel through the ‘golden era’ of New Zealand history. Find out about the Otago Goldfields Heritage Trust Cavalcade which has become a popular annual event usually held in March. Each year a different town along the Heritage Trail hosts the annual celebrations. You can visit these sites and many more yourself or we can organise a guide who will give you a fascinating insight into the lives of the miners in the mid to late 1800s. And you can do some prospecting yourself. Although the area is small by international standards, Central Otago is fast gaining an international reputation for its Pinot Noir. The region can be divided into 4 sub-regions - the Cromwell Basin, Clyde and Alexandra, the Gibbston Valley and the Lakes. The Cromwell Basin accounts for 70% of the plantings in the region. 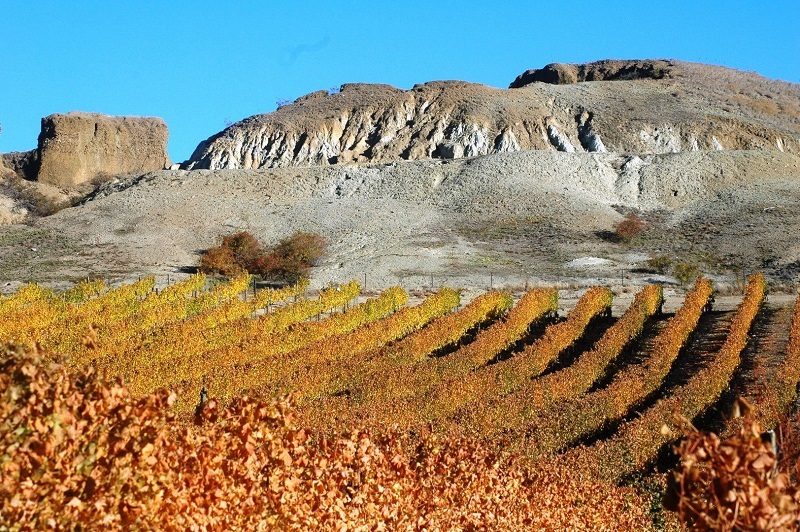 The vineyards in the Bannockburn area of the basin grow amongst spectacular craggy sluiced hillsides that were once worked by the gold miners just above the fast flowing Kawarau River. The vineyards in the south west region at Clyde and Alexandra account for 10% of the plantings in the region and grow amongst the rocks and rugged schist tors overlooking the Clutha River. Apart from the region’s preferred Pinot Noir, the white aromatic wines like Pinot Gris and Reisling are also starting to make a name for themselves. The vineyards in the Cromwell Basin and at Clyde and Alexandra are closest to Naseby and can be easily visited on your travels through Central Otago. Cromwell Basin: Felton Rd, Mt Difficulty, Akarua, Bald Hills, Carrick, Wooing Tree, Mt Michael, Kawarau Estate, Aurum, Rockburn, Desert Heart, Quartz Reef, Northburn Station, Black Quail. Clyde and Alexandra: Three Miners, Dry Gully, Two Paddocks, Black Ridge, Judge Rock, Shaky Bridge Wines, 8 Ranges, Grey Ridge, Drumsara. While dining out in Naseby during your stay, make sure to ask and try some of the Central Otago wines all the restaurants in Naseby stock at different times of the year. All the wineries listed above have websites so check out visiting times and the availability of their wines before you visit Central Otago. You can visit most of them independently or relax and be driven around the region by one of several companies that organise wine tours. Again, we are happy to book places on a recommended tour for you. Click photo above to find out more about wine of central Otago. Some of the Maniototo Dams were formed in the first instance to provide water for goldmining and subsequently for the irrigation of crops and grazing-land. They now provide good trout fishing sites. All of these dams, some on private land, are able to be fished from October through to April, while others are accessible all year round. You are asked to respect the landowners’ property by leaving your dog at home and taking your rubbish with you when you leave. Also, there will be times during the year when areas are closed due to lambing or property maintenance. Here in the Maniototo you can fish in all weathers and you will find there is little pressure on the fisheries. 1. Both the Hoffman’s Dam and the Coalpit Dam are close to Naseby and can be fished all year round. They are surrounded by the forest and are home to both brown and rainbow trout. There is a bag limit of 3 fish. 2. Blakely’s Dam and Mathias’s Dam are 15 minutes drive from Naseby and are open from October through to April and have a bag limit of 3 fish. Both dams are part of the Maniototo irrigation system and are stocked with both brown and rainbow trout. 3. From just below the Taieri River Gorge on the Styx to Patearoa Rd, the river winds slowly to Kokonga, making it a good long stretch to fish using all the different methods at your disposal. Again, the season runs from October through to April and has a bag limit of 6 fish. All methods of fishing are allowed in the waters of the Maniototo. You can use worms as bait, and spinners like Wobblers and Tobys. Again, fly fishermen can explore different methods using wet or dry flies depending on the time of the season. You can try your luck (or expertise) alone or we can arrange for any one of several leading fishing guides in the area to take you fishing if you prefer. If you would like us to organise a guide for you, let us know in plenty of time so that you don’t miss out on the day or days that you require. Highly recommended, with challenging doglegs and plenty of trees that mean you have to get your ball in the right place on the fairway to get to the green in regulation. Just on the outskirts of Naseby, surrounded by the Black Forest and with glimpses of the iconic Mt Ida and Ida Range. Green Fees: $15.00 for eighteen holes $10.00 for nine holes (please check current rates with club). Right in Ranfurly and with great views of the ranges surrounding the Maniototo Plains. Definitely some of the best greens in Central. Green Fees. $15.00 for eighteen holes $10.00 for nine holes (please check current rates with club). If you want to get away from it all, there are some really great walks in and around Naseby. As Peter Dymock says in his book Day Walks of Central Otago and the Queenstown Lakes District, “The Maniototo is to many the ‘real’ Central Otago... the home of the ‘southern man’, of the brewery ads and of the empty big sky country.” It’s where Central Otago is called ‘Central’; where the Royal Hotel in Naseby is called the ‘bottom pub’ and the Ancient Briton the ‘top pub’. This Grade 1 walk takes in the Naseby Forest and the Hogburn Gully where gold was discovered in 1863. It takes about 3 hours, although it’s highly recommended that you take time to stop for a picnic at the many picturesque spots along the way. The forest has a network of walking tracks and is also a mecca for mountain bikers from all over the country with trails of all grades of ability. The track passes several dams and the Mt. Ida water race as it winds its way through the old forest which was established in the early 1900s. Stop off for a refreshing pint at one of the pubs, or for great coffee and cake at the Black Forest Café after your walk. The Mt. Buster walk is a Grade 3 walk and with a 550 metre vertical climb is a little easier than the Hawkdun Range walk. It will take you between 4-5 hours for the return walk if you don’t get side-tracked! Gold was found here in 1864 soon after it was discovered in Naseby. Just below the 4,000 ft summit of Mt. Buster, the mounds of dazzling white quartz pebbles and the landscape created by the miners’ sluicing guns, are testimony to the lengths to which gold miners went in order to recover gold. These are just two of many walks in the area, and there are variations on these as well. The tourist centre in Naseby has more information and Peter Dymock’s book is well worth purchasing if you’re serious about a good day's walk in ‘Central’. While Central Otago is dominated by the ‘big empty sky’, the spectacular mountain landscape provides a challenging home for the many varieties of plants and insects that live there. The moon-like features of the rocky Otago schist outcrops or tors have been exposed as the surrounding grounds have been weathered away. The Rock and Pillar Range, Rough Ridge, Raggedy Range and Old Man Range all have wonderful examples of these distinctive and sometimes spectacular rock formations and tors. The hills and mountains of Central Otago are home to ancient soils and a large variety of wild flowers, rare and mainly native. Once the snow clears after the usually harsh winter, there is a 5-6 month growing season for the plants from late spring to early autumn. Because of these harsh conditions the plants need to be tough, strongly rooted and low growing. There is a wide variety of plant life including cushion fields, alpine shrubs and herbs, attractive tussock grasses, daisies and buttercups. Along with the many plant species there is a wide range of insects, usually brightly coloured and hairy, which have adapted to the alpine conditions. The best area to explore at any one time changes as the season progresses and you will need to be advised in this regard. You can explore the hills and mountains and see the flowers and insect life on foot, mountain bike or 4 wheel drive. If you wish we can organise a knowledgeable guide and transport to accompany you on a day in the hills to see the wildflowers. There are so many things to do in and around Naseby and some have been identified under their own headings in ‘Things To Do’ but that’s not all you can do during your stay in Central. The Real Dog Company offers the thrilling experience of riding with a sled dog team (with or without snow) through the Naseby forest. Or you can visit the kennels and interact with the sled dogs. The Art Deco Walk at Ranfurly has become a popular attraction since its inception in 1999. The walk takes about an hour and passes more than 30 sites where there are fascinating Art Deco buildings constructed after the suspicious and devastating fires which destroyed many of the town’s buildings in the early 1930s. The most photographed building on the walk is the Centennial Milk Bar, home to the excellent Rural Art Deco Museum. This lies adjacent to the refurbished Railway Station housing many photographs and stories of Ranfurly’s past and acting as the town’s i-SITE Visitor Centre. 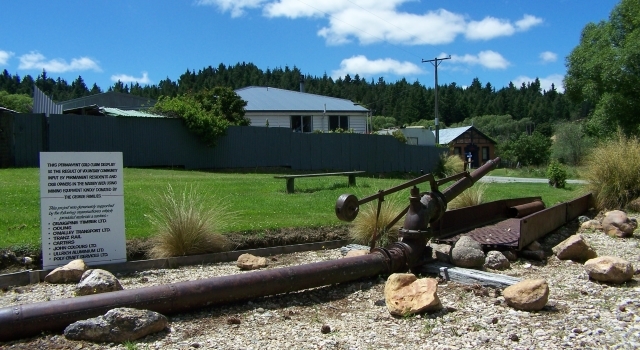 The Hayes Engineering Works at Oturehua are well worth a visit even if you’re not at all mechanically inclined. In the 1890s Ernest Hayes invented and manufactured tools and equipment, including wire strainers, which were to add efficiencies to agriculture in the area. These inventions soon found a place on farms nationally and later internationally. The power for the manufacturing process was first produced in 1910 by a 60 ft high windmill that he constructed. Because of the problems associated with wind power, Hayes later built a water-driven Pelton wheel which was powered by water from a reservoir at the top of the hill adjacent to the factory. The works are open during the weekends from August through to May and now belongs to the New Zealand Historic Places Trust. The Old Doctor's Residence is one of the oldest lived in houses in New Zealand. It has a rich and fascinating history. The Old Doctor's Residence began life in the early 1870s as a tiny gold miner's cottage. A beautiful historic home set in the town of Naseby, a stunning area of the South Island of New Zealand. Come and see what the Old Doctor's Residence has to offer.